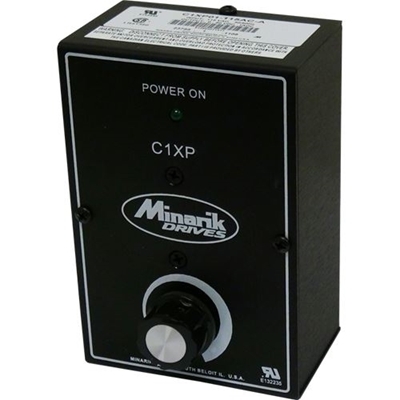 For applications requiring basic drive protection from falling objects or incidental contact, Minarik Drives offers the C1XP01-115AC-A, a low cost, high performance pulse-width-modulation (PWM) DC motor speed drive housed within a NEMA 1 enclosure. This filtered drive has a power-on LED and a power switch/speed adjust knob located on the front of the case. With a 115VAC input, the C1XP01-115AC-A controls 130VDC brush-type motors from 1/100 to 1/10 HP. Standard XP drives accept any voltage ranging from 90 to 130VAC. XP drives contain an inexpensive unipolar power supply, which enables them to accept any DC voltage input between 100 and 160VDC. After proper calibration, users can also operate low voltage motors without additional circuitry. All Minarik Drives filtered PWM drives yield a constant 1.05 form factor or less over the 80:1 speed range resulting in smooth, quiet, cool, and low maintenance motor operation. NEMA 1 enclosure: Metal enclosure for indoor use protects against dirt, dust and bodily contact. User adjustable calibration pots: IR compensation, min speed, max speed, forward and reverse torque, forward and reverse acceleration and tachometer. Diagnostic LEDs: Power On light on front of enclosure, LEDs inside cover for power, forward and reverse direction and forward and reverse current limit. Stopping Modes: User can regeneratively brake (run/brake switch), coast to a stop (power on/off switch) or decelerate to zero via internal jumper.